This month will see work begin on extending Barclays Cycle Superhighway 2 to Stratford, including 3km of separated cycle lanes, new early start traffic signals at the notorious Bow Roundabout and ‘Bus Stop’ bypasses for cyclists. According to Transport for London (TfL), there’s been an overwhelming number of respondents to the consultation process which has seen modifications of the cycle bus stop bypass designs to provide further improvements, in particular to manage the interaction between cyclists and pedestrians – primarily adding additional road markings and signage. A new fully accessible crossing point will also help reduce cyclist speed and signs and on-board and bus-stop messaging will remind bus passengers about the cycle bus stop bypass. The changes also include dedicated facilities at junctions to help cyclists get ahead of traffic, as well as improved road surfaces and less street clutter to make cycling more comfortable. In addition there’ll be new road markings and signs showing journey times and links to other cycle routes. TfL is tackling the south-eastern junction of Bow Roundabout with an early-start traffic signal system for cyclists. This scheme will install a system similar to that installed on the north-western arm, which will help improve safety due to the reduced risk of conflict between cyclists travelling straight ahead and vehicles turning left, TfL says. TfL is also writing to the Department for Transport (DfT) to ask for permission to change the red signal on the cycle-specific signal to include a red cycle logo, following independent research at Transport Research Laboratory (TRL). This will allow the cycle-specific traffic signals to be more clearly defined, helping to reduce possible confusion at the junction. Subject to DfT approval, it is hoped that this upgrade to the early start system can be delivered later this year. Here’s a round of quotes on the extension. Andrew Gilligan, the Mayor’s Cycling Commissioner, said: "In line with the Mayor’s pledge to ‘go Dutch,’ this will be the first of several new segregated bikeways in London, along with improved non-segregated routes. It’s not going to transform life for cyclists on its own, because it will only form part of most people’s journeys, but it’s a very important start." Leon Daniels, Managing Director of Surface Transport at TfL, said: "This new extension of Barclays Cycle Superhighway 2 will see a range of new and more innovative cycle safety provisions delivered to east London. By extending the route to Stratford, cyclists heading to the Queen Elizabeth Olympic Park will have more accessible, safer routes, reflecting our ongoing commitment to deliver safer streets for all." Sir Robin Wales Mayor of Newham said: “We’re pleased that TfL have listened to the views of Newham residents and the Barclays Cycle Superhighway scheme will now incorporate a large number of the safety aspects they wanted to see. 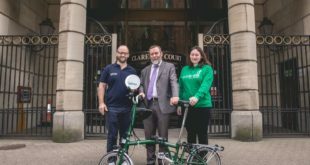 The scheme is a big step forward in delivering high-quality cycle infrastructure to improve safety for cyclists, pedestrians and other road users." Over 600 stakeholders and members of the public responded to the consulations, with 83 per cent supporting the proposals and 11 per cent partially supporting the proposals.